Part of well-kept two-family stone house, set near the small hamlet of Montenero d'Orcia, in a hilly position on the slopes of Mount Amiata. Large living room with kitchen area, 3 double bedrooms each with air conditioning and private bathroom. Extensive equipped grounds with private swimming pool (55 m2) and barbecue. 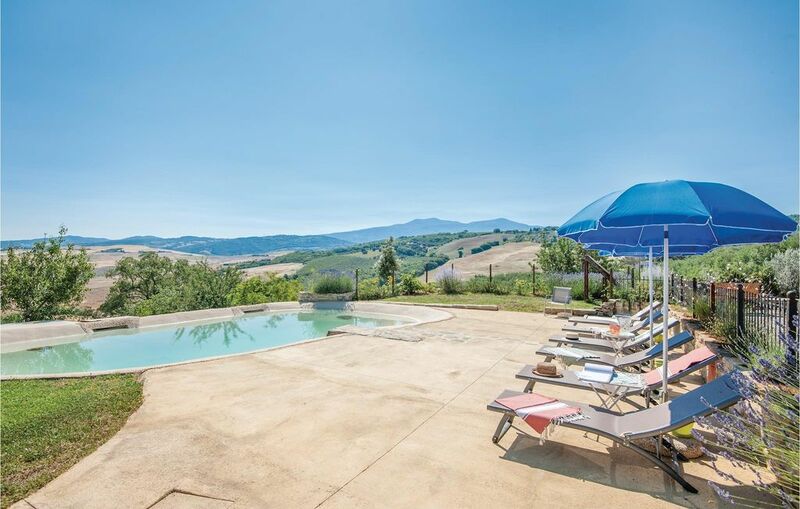 Fascinating location overlooking the Val d'Orcia from the one side and the Maremma and Mount Amiata on the other side. 1 km Montenero d'Orcia with supermarket, bar, restaurant-pizzeria; 14 km Castel del Piano (various shops), 22 km the medieval town of Montalcino, home of Brunello, one of the most famous Italian wines in the world, 44 km Pienza, 45 km Grosseto, 47 km the thermal baths of Saturnia, 57 km Montepulciano, 60 km the beaches of Marina di Grosseto on the Tyrrhenian coast, 67 km Siena. Important: Children under 14 years must be accompanied in the pool by their parents.